I began ringing handbells in a traditional church choir, responsible for two bells with the accompanying sharps and flats, but I soon became aware of the limitless potential of this unique instrument. 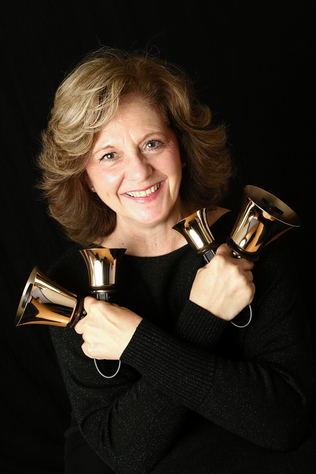 I immersed myself in the world of handbells by touring with numerous groups, attending countless seminars and studying with Master Teachers in the Handbell Guild. With the support and encouragement of many people, I discovered my passion to ring as a soloist. Performing as a Solo Handbell Artist has allowed me to combine my training and experience as a dancer with the unique qualities of this beautiful instrument to create visually exciting and audibly beautiful presentations for my audiences. Whether you are a new to the art of handbell ringing or have been a fan for years, I invite you to explore the fascinating art of handbell ringing with me. "Marie is a gifted musician, a very gracious individual, and one who is always easy to work with. Her musical abilities and positive spirit bring joy to every occasion."